For other people named William Paterson, see William Paterson (disambiguation). 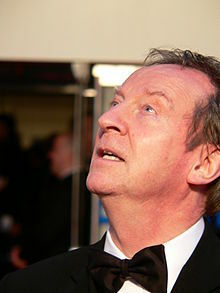 Bill Paterson (born 3 June 1945) is a Scottish actor and commentator, best known for playing the lead role in the BBC One paranormal, mystery drama Sea of Souls between 2004 and 2007. He also played the lead in the Bill Forsyth movie Comfort and Joy in 1984. In 2010, he appeared in the Doctor Who episode "Victory of the Daleks". Born in Glasgow, Paterson spent three years as a quantity surveyor's apprentice before attending the Royal Scottish Academy of Music and Drama. Paterson made his professional acting debut in 1967, appearing alongside Leonard Rossiter in Bertolt Brecht's The Resistible Rise of Arturo Ui at the Glasgow Citizens Theatre. In 1970, Paterson joined the Citizens' Theatre for Youth. He remained there as an actor and assistant director until 1972, when he left to appear with Billy Connolly in The Great Northern Welly Boot Show at the Edinburgh Festival. Paterson would work with Connolly again, some years later, when he performed in Connolly's play An Me Wi' a Bad Leg Tae. Paterson spent much of the 1970s in John McGrath's theatre company, 7:84, touring the United Kingdom and Europe with plays such as The Cheviot, the Stag, and the Black Black Oil. He was a founding member of 7:84, and made his London debut in 1976 with the company. He appeared in the Edinburgh Festival and London with John Byrne's first play, Writer's Cramp, and he first appeared in the West End when he took over the lead role in Whose Life Is It Anyway? at the Savoy Theatre in 1979. Paterson's career began to centre more on television than the theatre. His first appearances included the 1978 BAFTA award winning drama Licking Hitler, and playing King James in the UK television serial Will Shakespeare the same year. He played Lopakhin in the BBC production of The Cherry Orchard in 1981. Paterson did not, however, entirely neglect the theatre, and in 1982, he was nominated for a Laurence Olivier Award for his performance as Schweyk in another Brecht play, Schweik in the Second World War at the National Theatre. He was in the original National Theatre production of Guys and Dolls (1982), Death and the Maiden at the Royal Court and Duke of York's (1991–92) and Ivanov at the Almeida, London and Maly Theatre, Moscow (1997). His most recent theatre is Earthquakes in London at the National Theatre in the summer of 2010. The early 1980s also saw Paterson beginning to appear in films, including The Killing Fields, Comfort and Joy and A Private Function (all 1984). Other film credits include Dutch Girls (1985), The Adventures of Baron Munchausen (1987), The Witches (1990), Truly, Madly, Deeply (1990), Chaplin (1992), Sir Ian McKellen's Richard III (1995), Bright Young Things (2003), Miss Potter (2006), How to Lose Friends & Alienate People (2008) and Creation (2009). In 1997, he appeared as Brian, a cafe owner who knows the Spice Girls, in Spice World. His extensive and award-winning TV career includes a memorable portrayal of villain Ally Fraser in series 2 of Auf Wiedersehen, Pet (1986), Smiley's People (1982), The Singing Detective (1986), Traffik (1988), The Crow Road (1996) and Doctor Zhivago (2002). Much of his later work has been for the BBC, starring as Dr Douglas Monaghan in three seasons of the supernatural drama series Sea of Souls. He also played the role of Dr Gibson in the 1999 production of Wives and Daughters, and appeared in the 2008 BBC production of the Charles Dickens novel Little Dorrit as Mr Meagles, as DS Box in the first series of Criminal Justice (2008), and as Dr James Niven in Spanish Flu: The Forgotten Fallen; from 2009–10 he appeared as George Castle, the head of the CPS in Law & Order: UK. Throughout his career he has appeared regularly in radio drama and provided the narration for a large number of documentaries. He provided the voice of the Assistant Arcturan Pilot in Episode 7 of the original BBC Radio 4 version of The Hitchhiker's Guide to the Galaxy in 1978. In 2005, he would take a similar role as Rob McKenna, a lorry driver and unknowing Rain God, in Fits the 19th, 20th, and 22nd of The Hitchhiker's Guide to the Galaxy: Quandary Phase. He also played the key role of SIS Chief Percy Alleline in the 2009 BBC Radio 4 version of Tinker Tailor Soldier Spy. In 2010, Paterson starred in Doctor Who as Professor Edwin Bracewell, in the episode "Victory of the Daleks", with his character making a second appearance in the opening half of the season finale, "The Pandorica Opens". Later in the year, Paterson narrated the BBC Four wildlife documentary Birds Britannia. In 2011, Paterson starred in Fast Freddie, The Widow and Me. Paterson played lawyer Ned Gowan in the 2014 Starz period TV series, Outlander. In 2014 Patterson lands a part as Douglas Henshall's father in TV series Shetland. Paterson has also narrated for various television and radio programmes. In 2003, Paterson began broadcasting radio stories about his childhood in Glasgow, Tales From the Back Green on BBC Scotland, which led to them being published by Hodder in 2008 and appearances at many book festivals throughout the UK. He narrated the 2009 BBC TV programme 1929 — The Great Crash which recalled the Wall Street Crash of 1929 and compared it to the recent financial turmoil of 2008. He also narrates the BBC's annual coverage of the Royal Edinburgh Military Tattoo and in 2013 appeared as Adam Smith in The Low Road at the Royal Court. In 2016 he narrated The Farmers' Country Showdown, a series for the BBC following the agricultural show season and broadcast early in 2017. In 1984, Paterson married stage designer Hildegard Bechtler, with whom he has a son and a daughter. They live in London, England. Doctor Who Professor Edwin Bracewell "Victory of the Daleks"
Falcón Ignacio Ortega Episode "The Silent and the Damned"
^ "Paterson, William Tulloch". Who's Who. London: A. & C. Black. 2008. ^ "Portrait of the artist: Bill Paterson, actor". The Guardian. 7 February 2012. ^ "Royal Conservatoire of Scotland - Alumni". rcs.ac.uk. Archived from the original on 16 October 2012. ^ "The Complete Smiley: Tinker, Tailor, Soldier, Spy - Episode 2". Radio Times. Retrieved 14 February 2019. ^ Ferguson, Brian (10 June 2014). "Bill Paterson lands key part in Outlander TV show". The Scotsman. Retrieved 26 April 2015. ^ "BBC One - Shetland - Bill Paterson". BBC. Retrieved 14 February 2019. ^ "BBC One - The Farmers' Country Showdown, Series 1 30-Minute Versions, Pigs". BBC. Retrieved 14 February 2019.